A day at the track provides a lot of enjoyment on its own for horseracing enthusiasts, but owning a piece of the race is a huge part of the excitement of the sport. Racecourses have been adding free WiFi service to their venues over the past few years, and have reaped the reward from increased bets and happier patrons. Patrons have been thrilled with the convenience and added flexibility of placing their bets from their seats or even while enjoying their meals at trackside restaurants. There is no longer a need to rush though their meals to avoid missing betting opportunities. This past July, the New York Racing Association (NYRA) kicked off their 2012 season with a surprise addition for their loyal visitors. They have added a free racetrack WiFi network installed by Deep Blue Communications. The network was necessary to implement the mobile wagering platform, FastBet from United Tote. The FastBet mobile platform allows patrons to place bets right on their mobile devices from the comfort of their seats. Saratoga’s patrons no longer need to stand in line and wait to place their bets. They only need to obtain a NYRA cash card and load it to be able to make wagers from any of the public areas of the racecourse. With new gaming venues opening each year, racetracks must offer options that are more attractive to patrons. This includes offering more gaming and new and exciting ways to bet on the races. Racetrack WiFi accomplishes both of these tasks. It allows for all of the convenience of traditional WiFi features like access to email, web, and social networking sites so patrons can share their day at the track with friends, but with the added features accessible only at the venue, including on-track betting and advertising for other track promotions and specials. The convenience of mobile on-track betting has resulted in increased revenues. When patrons are not forced to spend part of their day waiting at the window, they have more time to wager, and tend to wager more. Attendance is up and handle, the industry term for amount wagered, is up 3.3% so far this season at Saratoga. Racetrack WiFi was only one of the many improvements that NYRA made this season, but it is reasonable to say that the addition of mobile on-track betting has certainly added to the increases. NYRA originally added free WiFi access to its Belmont venue back in 2008 and fans of both venues have been eagerly awaiting the arrival of a free racetrack WiFi service at Saratoga. 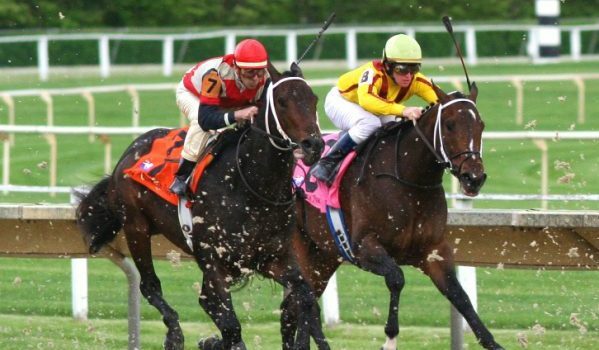 While some regular patrons could already access their wagering accounts through cellular Internet service, they became frustrated by slow connections when the track experienced high attendance and usage. NYRA wisely addressed these complaints by choosing Ruckus Wireless equipment, installed by Deep Blue Communications. Deep Blue Communications was able to meet the Saratoga’s data demands by designing a network using the full-featured and scalable ZoneDirector 5000s from Ruckus Wireless to control and manage all of the race day traffic. The WiFi network covers all of the 350-acre site’s public areas using the Ruckus Wireless Zoneflex 7962 indoor and 7762 outdoor antennas. Patrons are now able to place real-time wagers from anywhere on the track. The equipment that Deep Blue Communications installed also gives the racetrack management the ability to see what sites their patrons are visiting most often. The fact that the top six sites are racing research sites shows that Saratoga’s patrons are taking full advantage of their new WiFi access. NYRA has nothing to worry about as their racetrack WiFi service’s popularity continues to grow. The network is fully scalable and flexible enough to allow them to increase their bandwidth to fully meet the data requirements of their patrons as the popularity of the mobile wagering platform continues to increase.